Québec's biopharmaceutical industry welcomes a new centre of excellence in clinical research in Laval. Servier Canada, the Canadian subsidiary of French pharmaceutical company Servier, has just begun construction of a centre of excellence in clinical research at the Laval Technopole, a science and high-technology park. The announcement was made this afternoon at the company's Laval headquarters by its senior executives in the presence of Nicolas Marceau, Minister of Finance and the Economy, and Laval Mayor Martine Beaugrand. 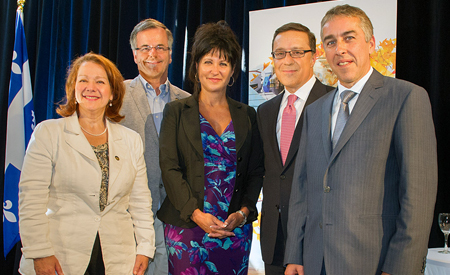 From left to right: Suzanne Proulx, MNA for Sainte-Rose; Guy Ouellette, MNA for Chomedey; Martine Beaugrand, Mayor of Laval; Frédéric Fasano, Chief Executive Officer, Servier Canada; and Nicolas Marceau, Minister of Finance and the Economy. The new 30,000-square-foot complex will house the activities of the Canadian International Centre for Therapeutic Research (ICTR) and the Servier Canada National Centre for Professional Training. Its mission will be to help further the development of drugs for cardiovascular diseases, certain cancers and neuropsychiatry. A total of 38 new employees will join Servier Canada in the coming months. This major $16.3-million investment was made possible by strategic support from Investissement Québec as well as $1 million in non-refundable financial assistance administered by the government corporation.